I actually purchased this table with a local thrift store Groupon, and it only cost me $12! 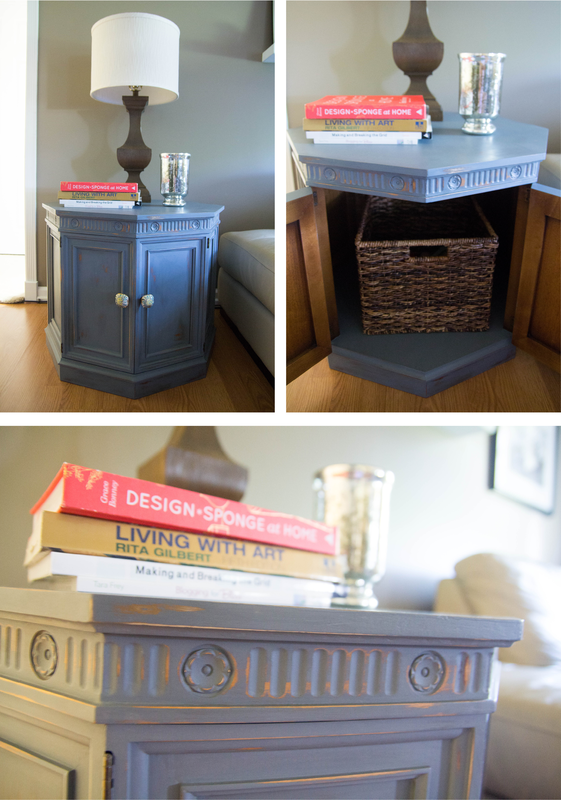 This was my first furniture painting attempt, and the first time using Annie Sloan Chalk Paint. 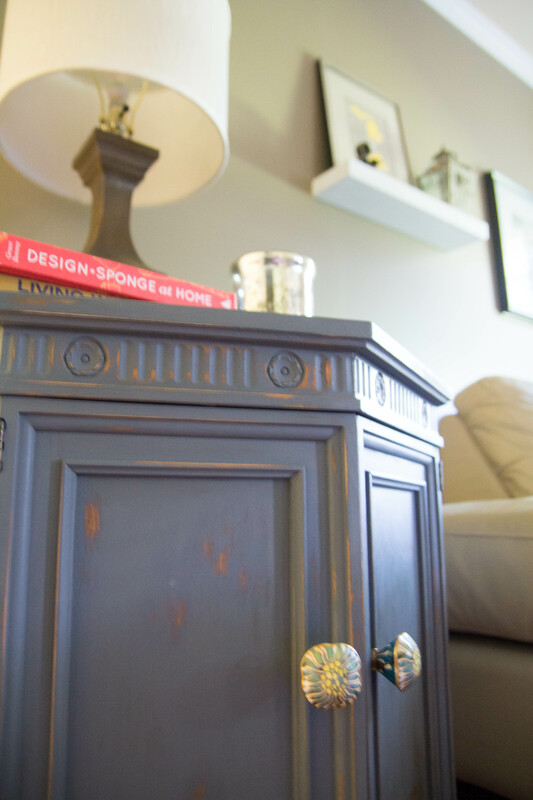 If you haven’t yet heard about this paint, its claim to fame is that it adheres to just about any surface and there is no prep work necessary before applying [meaning you don’t have to sand or prime your furniture before painting.] This is a huge time saver…I hate sanding! Another great feature of this paint is that the colors are mixable, and the Annie Sloan website shows you how to achieve many different shades. I love the matte, velvety finish. The only downside is that it’s a bit pricey, and because this is a UK-based company, I have to order through an American stockist and pay for shipping. 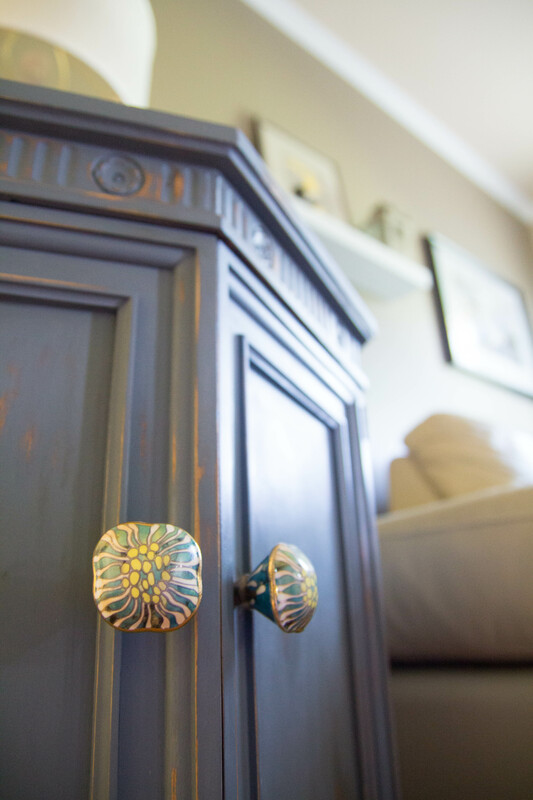 I still highly recommend it for all of the reasons listed above, and I have used Annie Sloan paint on several other pieces of furniture and have loved the results. I mixed three parts Graphite with one part Old White thinking the color would be a medium gray, but I found that once the table was set up in the living room it appeared to have more of a bluish hue to it, probably due to both the lighting and the contrast of the taupe wall behind it. The table looked a lot more gray against the white board and batten walls of the bedroom where I refinished the piece. Fortunately I still really liked the color despite it turning out differently than expected. 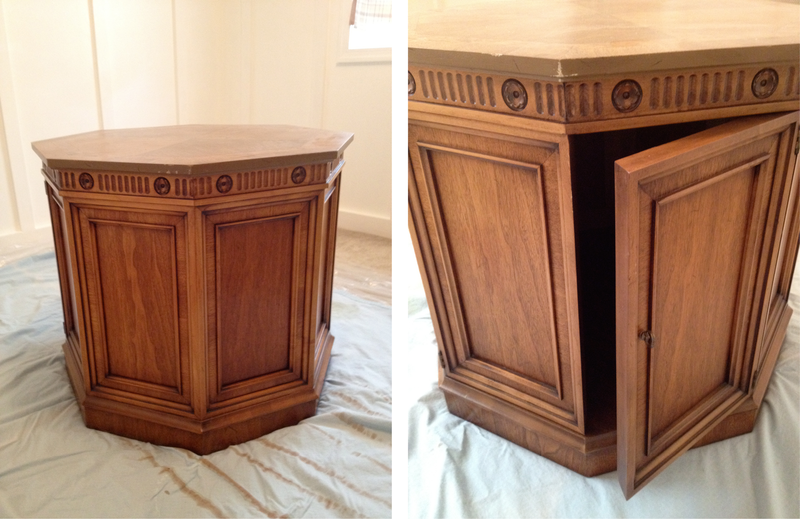 I lightly distressed the table with fine sandpaper and finished the surfaces off with a coat of clear wax. I found a cute basket to place inside the table and replaced the original pulls with ceramic knobs from Anthropologie. They no longer sell this style, but Anthro always has a great selection of hardware. I really like how the table turned out, and I learned a few things that helped me with other furniture revamps. For one, I knew that I wanted to try the graphite paint on other pieces without mixing in Old White. I also realized that I wanted to try a more subtle distressed finish on future pieces. Overall I call this project a success, and the table fits in well with the rest of the living room decor. Have you upcycled any thrift store finds? 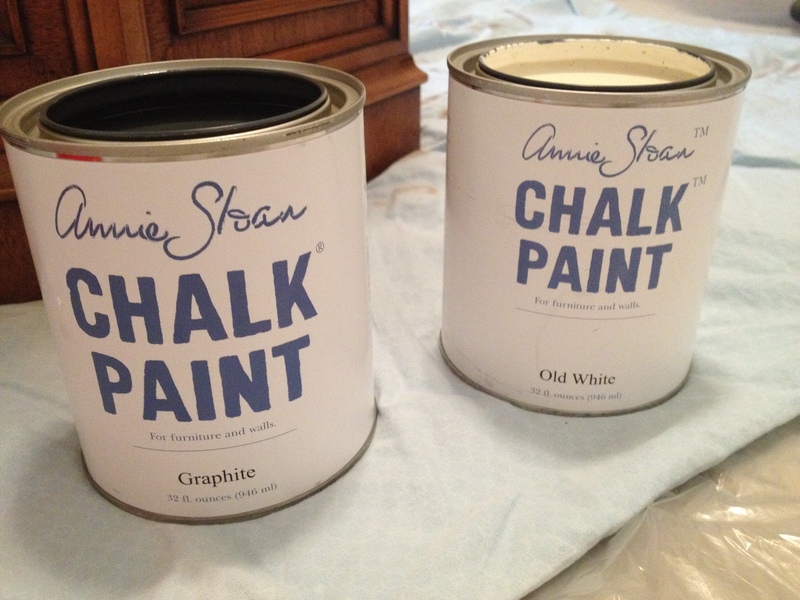 Anyone else tried out Annie Sloan paints? I’m always interested in hearing about other furniture painting tips/tricks/techniques.